This Canon F-730SX calculator is a two-line display scientific calculator which offers a basic array of functions: trigonometry, logarithms, exponents, polar and rectangular conversions, degrees and degrees-minutes-seconds conversions, and fraction calculations. The F-730SX has base conversions functions and Boolean functions AND, OR, XOR, and XNOR available only in Binary, Octal, and Hexadecimal modes. The Decimal mode works both for decimal integers and normal computation mode. The F-730SX offers 1 and 2 variable statistics, along with linear regression using the regression equation y = a + b*x. The F-730SX has a two line display, the top line where you enter your expressions and the bottom line is where the results of all calculations are displayed. 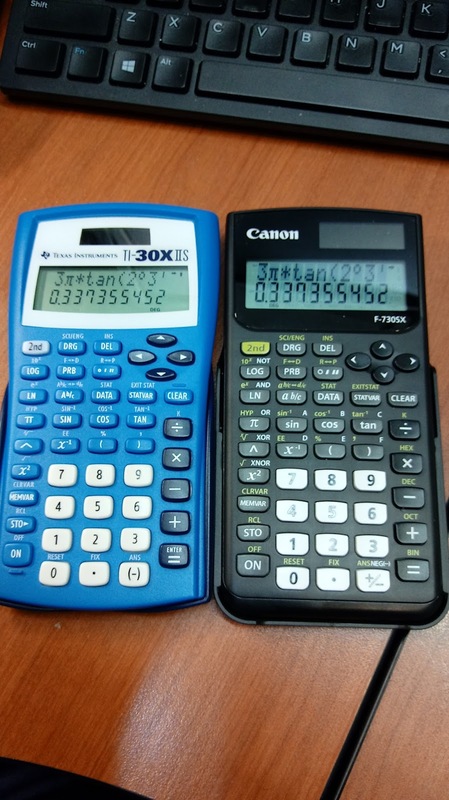 So this is a clone of the TI-30X IIS then? Not quite? If you look at the picture above, they both look very similar. However, there are few differences, most noticeable that the F-730SX has base conversions while the TI-30 XIIs doesn’t, and I also think the display is a bit larger on the F-730SX. My only real gripe with both of these calculators is on how memory is accessed. The variables are menu based, hence it takes extra keystrokes to access variables B, C, D, and E than it would with installing an ALPHA key. The speed of both calculators are comparable. The reasons why I would recommend a Canon F-730SX are these: the F-730SX is usually sold at a lower price than the TI-30X IIs, and you get base conversions. I would also argue that the screen is nicer, but the difference is not great, since the screen of the TI-30X IIs is still readable. 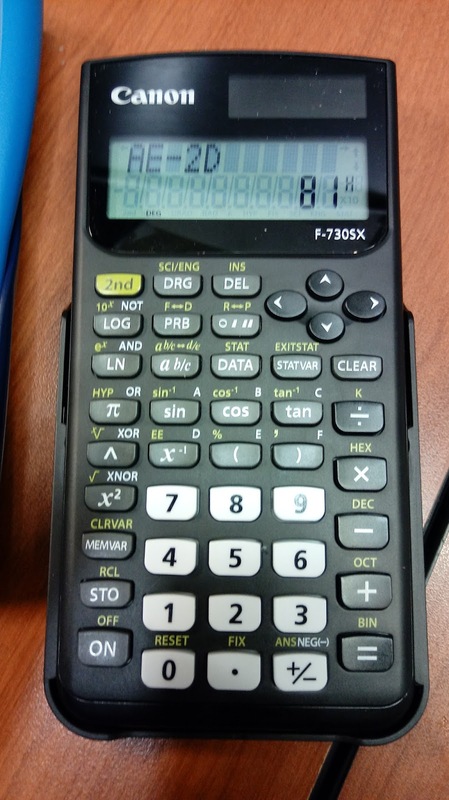 In Southern California (and maybe the United States), the F-730SX is currently sold at Fry’s, or you can get this calculator online too.